If your clients have tried various methods for losing weight without success then the key could be to train them how to trick their mind into helping them to eat less fattening food. Eating less means fewer calories and this unique approach has recently been proven by scientists to help people to not want to eat as much. In today's society obesity is a huge problem which needs to be addressed for the sake of the people who are affected by it and also for their dependents and the nation as a whole. Many obese people have been conditioned in one way or another into unhealthy eating patterns. Old habits die hard - however this script shows you how to help your clients to develop new eating habits whilst still enjoying the foods that they enjoy - no matter how many calories they contain. 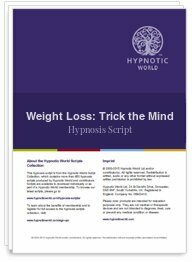 Download this Weight Loss - Tricking the Mind script today and be one of the first Hypnotherapists to use this unique approach.